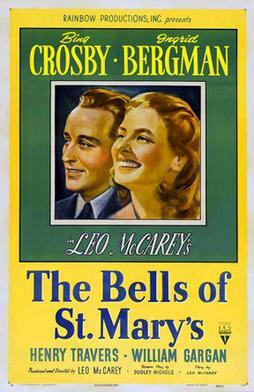 We just watched the Bing Crosby/ Ingmar Bergman classic Bells of St. Mary’s. Here are 10 reasons to watch it. If you like Bing Crosby, watch Bells of St. Mary’s. If you want to see just how far the culture war has gone since the 1940s, watch Bells of St. Mary’s. If you want to see Hollywood treat Catholic Christianity accurately and without awkwardness, watch Bells of St. Mary’s. If you want to see Hollywood successfully tell the story of rivalry-turned-buddy-love between two people, both gorgeous yet both celibate, without a hint of sexualizing their tension, watch Bells of St. Mary’s. If you want to hear a moving prayer about submission to the will of God in the midst of a difficult move across country, watch Bells of St. Mary’s. If you like It’s a Wonderful Life and want to watch the film that is playing in the theater in that movie, watch Bells of St. Mary’s. If you are wealthy and want inspiration toward generosity and philanthropy, watch Bells of St. Mary’s. If you like classic films, watch Bells of St. Mary’s. If you wondering how a film about a priest and a nun can be the 50th best grossing of all time, watch Bells of St. Mary’s.